In The Farm Shop Cookbook by Christine McFadden, there are a wealth of recipes celebrating the produce that is now widely available across Britain. Farm shops have become more and more popular as people choose to buy local and fresh. 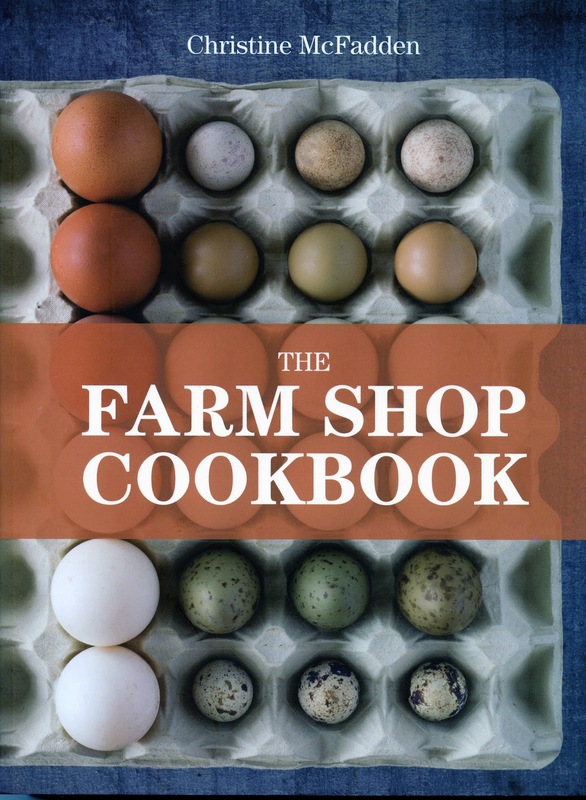 In the Introduction Christine tells us of her own experience of Farm Shops and how the intention of the book is to help us to make the most out of the produce available, some very familiar, others we may not have encountered before. She goes on to talk a little about the environmental advantages of buying from farm shops before taking us into a useful section on how to use the book, including guidance on buying by season, different varieties and storing your purchases. The Recipes: the introduction to the recipes this section gives some advice on basic ingredients, measurements and techniques. There follows an A-Z of produce with recipes, each item is given a few paragraphs of introduction with cooking ideas. The side bar tells you when the item is available, which varieties to look for, some shopping notes, storage advice and preparation tips. For some items there are several recipes and there are excellent photographs of many of the dishes. Mushrooms - Mushrooms with Pappardelle, Pine Nuts, Cream, Garlic and Parmesan. These are just a few of the ingredients and recipes in the book, there are many more. Anyone who enjoys fresh seasonal produce, also useful for novice cooks who would like to learn more about produce and what to do with it. Pros - the ingredients are listed in alphabetical order, so if you have carrots, you can easily find that section and the recipes. One of my favourite sections is the UK seasonal produce availability, a grid where you can check out what is available, useful to check before heading out to the farm shop. 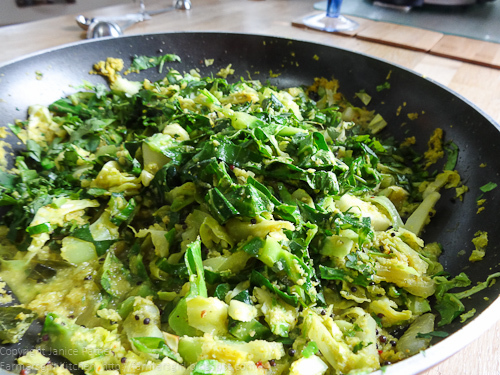 Based on a traditional recipe from Kerala in south-west India, this is a great way of livening up cabbage. Put the spice paste ingredients in a blender or food processor. add a splash of water to moisten, then whizz to a puree. Heat a large, heavy-based frying pan over medium-high heat and add the vegetable oil. Fry the mustard seeds until they start to crackle, then add the curry leaves. Sizzle for a few seconds. Reduce the heat to medium, add the onion and fry until golden. Season with the crushed peppercorns, then stir in the spice paste, shredded cabbage and spring greens. Pour in the water, stirring well so the cabbages are covered with the paste. Cover and cook over low heat for 7-10 minutes, stirring now and again to prevent sticking. 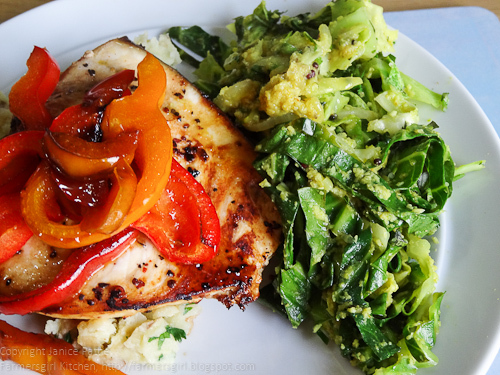 When the cabbage and spring greens are tender, add the coconut flakes, coriander ad lime juice. Stir for a minute or two to heat through. Although there are a lot of ingredients in this recipe, it is really quite simple to make and transforms ordinary cabbage into an amazing and exotic feast. I served it with pan fried sword fish and peppers. I would definitely make this recipe again. With thanks to Emma for providing me with a copy of The Farm Shop Cookbook to review, I was not paid for this review and all opinions are my own. Adding the coconut definitely moves this on to another level. It reminds me a bit of a cabbage and carrot Madhur Jaffrey recipe I use a lot, but hers has no coconut. The book sounds like a good one. Forgotten Fatherland - a book for Father's Day?